What is quiet and loud, city and country, new and old? 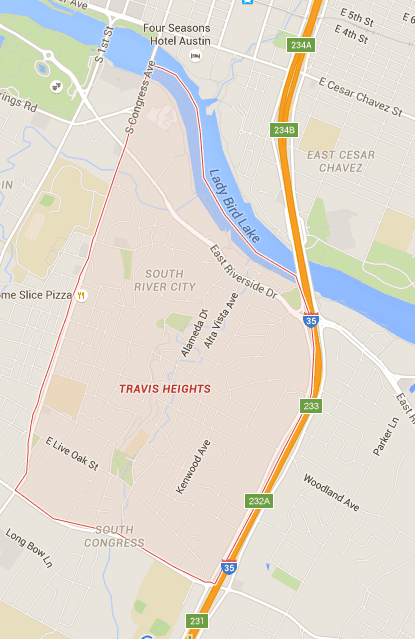 The Travis Heights neighborhood that truly has the best of both worlds. Spanning from I-35 on the east to Congress Avenue on the west, the northern border is Lady Bird Lake (or Riverside Drive) and the southern border is Oltorf Street – this is a place where residents can grab an afternoon run along the creekside trail before walking to South Congress Avenue for fajitas & margaritas with friends. Established in 1913, Travis Heights is a quaint neighborhood in south central Austin in high demand for its unique and charming homes. There are plenty of families, but there are also young professionals, artists and musicians. I love that this is free, spaciously green spot to hang with the kids on a sunny afternoon. In the midst of an area known for its trendy shops and eateries, this 9-acre park (in total) is split into two sections—Big Stacy Park and Little Stacy Park, with – ironically enough – the latter being bigger than the former. The 3-acre Big Stacy Park has natural shade, a walking trail and a free-admission year ‘round swimming pool, while the 6-acre Little Stacy Park has tennis, basketball and volleyball courts, a wading pool, playground, grills and picnic tables. The two areas are connected by the Blunn Creek Greenbelt. I’ve found it does get busy on the weekends, but hey… bring a picnic blanket and enjoy the people watching!